Head Coach Vic Fangio poses for a group photo with other staff members at a meet-and-greet visit with team employees at Broncos Stadium at Mile High on March 19, 2019. Head Coach Vic Fangio speaks with Chief Commercial Officer Mac Freeman and Executive Director of Community Development Allie Pisching, among others, at a meet-and-greet visit with team employees at Broncos Stadium at Mile High on March 19, 2019. Head Coach Vic Fangio receives a tour of team facilities from Chief Commercial Officer Mac Freeman at a meet-and-greet visit with team employees at Broncos Stadium at Mile High on March 19, 2019. Head Coach Vic Fangio meets Jay Roberts, the stadium general manager, at a meet-and-greet visit with team employees at Broncos Stadium at Mile High on March 19, 2019. Head Coach Vic Fangio speaks with Dennis Moore, Senior VP of Sales and Marketing, Dan Hawley, Senior Director of Corporate Partnerships and Jay Roberts, General Manager of Stadium Management Company, at a meet-and-greet visit with team employees at Broncos Stadium at Mile High on March 19, 2019. Head Coach Vic Fangio at a meet-and-greet visit with team employees at Broncos Stadium at Mile High on March 19, 2019. Head Coach Vic Fangio speaks with Shawna Peters, Director of Cheerleaders, among others at a meet-and-greet visit with team employees at Broncos Stadium at Mile High on March 19, 2019. Head Coach Vic Fangio speaks with Russ Jenisch, Senior Director of Event Presentation and Production, and Lauren Giangregorio, Program Manager for the Cheerleaders, among others at a meet-and-greet visit with team employees at Broncos Stadium at Mile High on March 19, 2019. Head Coach Vic Fangio greets Director of Marketing Ted Santiago at a meet-and-greet visit with team employees at Broncos Stadium at Mile High on March 19, 2019. 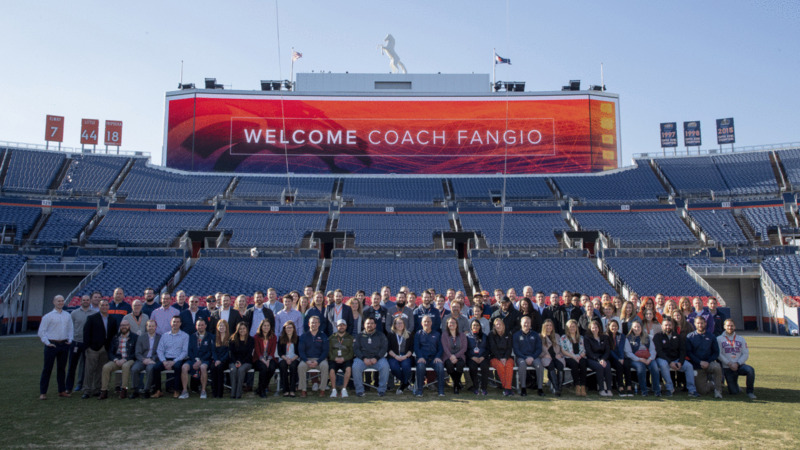 Staff members find their seats for a meet-and-greet visit and Q&A session with Head Coach Vic Fangio at Broncos Stadium at Mile High on March 19, 2019. Head Coach Vic Fangio speaks with Q&A emcee Phil Milani at a meet-and-greet visit with team employees at Broncos Stadium at Mile High on March 19, 2019. Head Coach Vic Fangio takes a question from a staff member at a meet-and-greet visit with team employees at Broncos Stadium at Mile High on March 19, 2019. Staff members listen as Head Coach Vic Fangio answers a question at a meet-and-greet visit with team employees at Broncos Stadium at Mile High on March 19, 2019. Head Coach Vic Fangio answers a question at a meet-and-greet visit with team employees at Broncos Stadium at Mile High on March 19, 2019. Head Coach Vic Fangio reeds off a raffle number at a meet-and-greet visit with team employees at Broncos Stadium at Mile High on March 19, 2019. Human Resources Coordinator Paiao Thornton and event emcee Phil Milani show off a shirt autographed by Head Coach Vic Fangio during a raffle at a meet-and-greet visit with team employees at Broncos Stadium at Mile High on March 19, 2019. Head Coach Vic Fangio poses for a photo with a raffle winner at a meet-and-greet visit with team employees at Broncos Stadium at Mile High on March 19, 2019. Head Coach Vic Fangio autographs a helmet for a raffle at a meet-and-greet visit with team employees at Broncos Stadium at Mile High on March 19, 2019. Head Coach Vic Fangio hands an autographed helmet to a raffle winner at a meet-and-greet visit with team employees at Broncos Stadium at Mile High on March 19, 2019. Head Coach Vic Fangio speaks with a staff member as they walk to the field at a meet-and-greet visit with team employees at Broncos Stadium at Mile High on March 19, 2019. Head Coach Vic Fangio speaks with staff members at a meet-and-greet visit with team employees at Broncos Stadium at Mile High on March 19, 2019. Head Coach Vic Fangio shares a laugh with a staff member at a meet-and-greet visit with team employees at Broncos Stadium at Mile High on March 19, 2019. 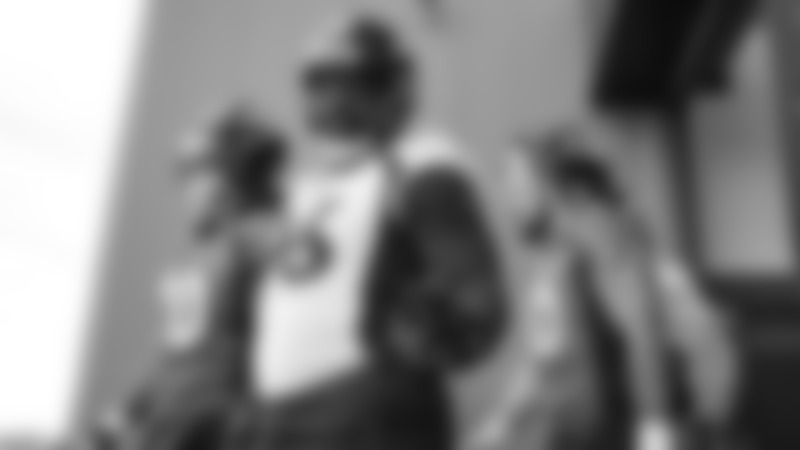 Head Coach Vic Fangio poses with other staff members for a group photo at a meet-and-greet visit with team employees at Broncos Stadium at Mile High on March 19, 2019. Head Coach Vic Fangio speaks with a staff member as they leave the field at a meet-and-greet visit with team employees at Broncos Stadium at Mile High on March 19, 2019.